Pod coffee makers have been sweeping the market by storm with the promise of hassle-free brewing. Because let’s be honest, the very thought of cleaning up after whipping up a cup of joe is the stuff of migraines! And in this new land of convenience, Nespresso reigns supreme. Almost synonymous with coffee pods, Nespresso has made mornings that much simpler with the ability to quickly churn out delicious java at the touch of a button. And now, the Nespresso Pixie Espresso Maker could just be their greatest hit yet. Going by its name, the Pixie Nespresso is exactly what you’re thinking it would be: small and beautiful. But can a machine this tiny really tantalize your taste buds? 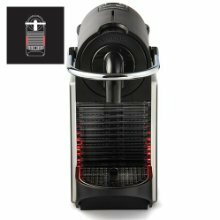 Our aim is to give you a comprehensive review that will tell you all you need to know about the Nespresso Pixie Original Espresso Machine By Breville. 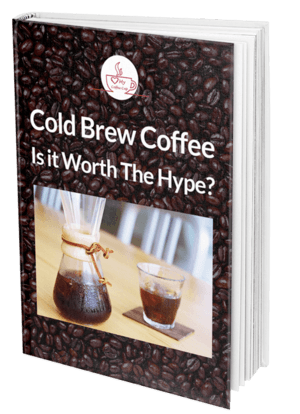 Our hope is that you can make an informed choice as you get this coffee maker. Features that stood out to us. Upsides and downsides of this product. Wondering if Nespresso coffee is any good? 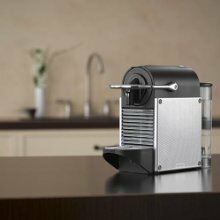 Well, let's dive into the Nespresso Pixie Espresso Maker Reviews! The Pixie takes the whole concept of compactness and takes it to the next level. The unit is designed with urban kitchens in mind, measuring in at just 12.8 x 4.3 x 9.3 inches. Yup, you read right. This beauty is just 4.3 inches wide. And we don’t throw around the word beauty lightly. This brewer is set to be the focal point of your kitchen thanks to the retro styling dusted with a modern touch. There is quite a bit of plastic going on though, but even this looks gorgeous complemented by the stainless steel accents. 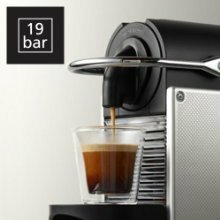 Nespresso has taken a minimalist approach, with the top of the unit sporting two buttons and the capsule chamber, the front highlighted by the nifty fold up drip tray, and the back featuring a removable 24 ounce water tank. The Pixie’s soul mate has to be the Aeroccino Plus milk frother that ​is treated as a separate purchase, but really ought to come as a Nespresso Pixie bundle. The beauty of this Nespresso milk frother can’t be overemphasized, with its stainless steel exterior reflecting light like a dream. Okay, we need to observe a moment of silence. Because the Pixie has given new meaning to silence! In a world filled with uber-noisy coffee makers that grunt, growl, and get on your nerves, this brewer operates like a whisper. It might be the silent type, but there is a lot of functionality hiding behind all the stillness. 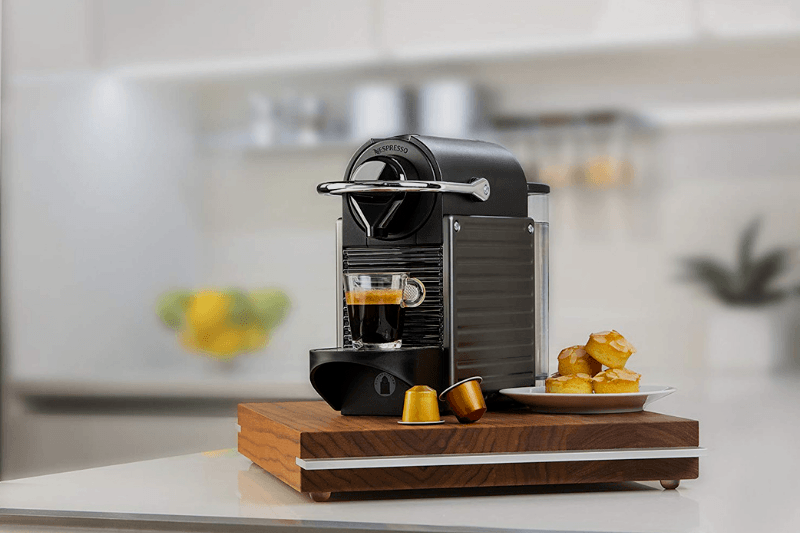 Nespresso Pixie Pods: Brewing on this unit is as easy as it gets. All you need to do is insert a Nespresso capsule, press a button, wait for about 30 seconds, and voila! You have yourself a brilliant shot of espresso. And that’s not a typo. Thanks to the thermoblock system, the brewer heats up in record time allowing it to pull a shot that quickly. 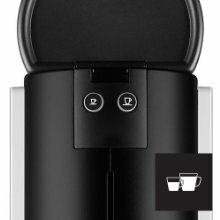 Programmability: The top of the coffee maker might just sport two buttons: one for espresso and another for lungo, but that doesn’t mean you’re confined to set volumes. By simply pressing down the buttons, you can customize the machine and choose between shots of 1oz, 2oz and 3oz. Brew duration: It’s also pretty simple to adjust the brew duration, allowing you to tweak the strength of your espresso. The Pixie gets major points for usability, with even the newest of newbies capable of mastering the controls in no time. Nespresso Frother: The Aeroccino Plus really deserves an award or two. Unlike its predecessor, the Aeroccino, that had tendencies of burning your milk; the Plus' non-stick interior completely eliminates any chances of this. Operating it is a breeze too. Just hit the button once to froth cold milk and twice if you’d like it hot. It has a maximum capacity of 130ml if you’d like to get your froth on and 250ml if all you need is some hot milk. The Nespresso Pixie is nothing but impressive when it comes to whipping up that joe. It takes just about 30 seconds to pull a shot and 1 minute to create a nice froth in the Aeroccino Plus. So in less than two minutes, you should be sipping on that latte or cappuccino you love so much. We also have to touch on the near noiseless operation again. If it wasn’t for the blinking lights, you’d even forget that the unit was on! This makes it perfect for those studio apartments where the walls are so thin your neighbor can hear you snore. The Pixie comes with a power saving mode designed to coddle your electricity bill. There is an auto-off feature that is set to 9 minutes by default but can be adjusted up to 30 minutes. For those forgetful ones among us, this little function is absolutely godsend. While the foldable drip tray is a pretty neat idea, allowing you to accommodate taller machiatto glasses, it can get annoying sometimes. When folded up, it doesn’t stay in place and requires you to stand there holding it up. Time better spent mindlessly surfing social media. PRO TIP: Nespresso pods go for about $0.55, which seems pretty fair, but the numbers can really shoot up if you’re a java addict. To cut down on the cost, try refilling your pods by carefully packing coffee in there and covering with a piece of foil. It takes some time to master but will certainly excite your wallet. Do you think of cleaning and immediately get a mini stroke? Well, this machine was designed just for you. The brewer is virtually mess-less, with the spent pods container easily holding about 10. The milk frother is also surprisingly easy to get spick and span, with a bit of warm water and soap getting the job done perfectly. Only makes a single cup at a time. Water reservoir is on the small side. The Nespresso Pixie embodies everything a pod maker is meant to be: compact, quick, and hassle-free. It also comes highly rated on Amazon, with a four and a half star rating and 853 customer reviews. Its small footprint is a huge plus, with the lightning-fast brew time making for nothing but convenience. If you’re a fan of milk-based espressos, you simply need to go for the Aeroccino Plus milk frother. This joins forces with the Pixie to create drinks that will simply blow you away. At a a very low price, this machine is a total steal. 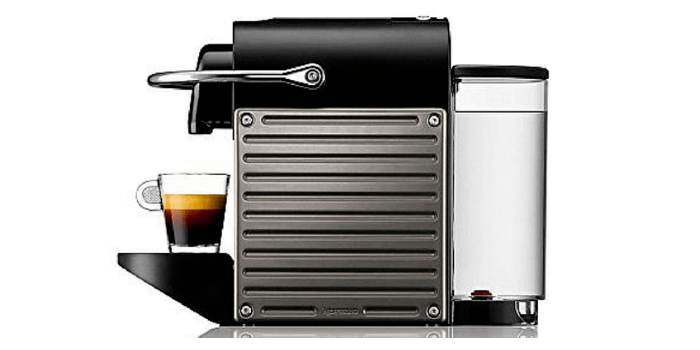 We hope you enjoyed reading our Nespresso Pixie Espresso Maker Reviews. let us know in the comments below!